The HTC Trophy is one of the worst kept Verizon secrets - we all know it's nearing release, but now we have yet another indication this is the case - a Verizon-branded dummy of the handset has appeared in a Best Buy store. While it would be a bit far-stretched to say this is a definite proof that the handset is to be launched soon, it shows something is in motion, which, if we take a look at the bigger picture, only confirms our suspicions that there is a high probability the HTC Trophy is to be launched on May 12 by Verizon. 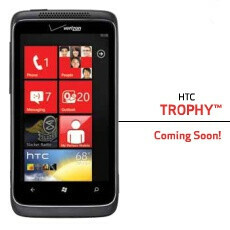 The HTC Trophy is to be the first WP-powered Verizon handset. It will offer a 3.8-inch TFT screen with WVGA resolution, 1GHz processor, 5MP camera with HD recording capabilities and 16GB built-in memory among other goodies. You are also invited to check our Upcoming Verizon Phones page to be sure you are well informed what's coming from Big Red! Hundreds of thanks to Thump3rDX17 for the tip. I wish we knew the EXIF data on that photo to determine if it was geotagged to see what Best Buy that dummy was located in. i took the picture, i know what Best Buy it was in but i'm not at Liberty to disclose that information. You know thumb, I sure wish you could Show Me 768 reasons to believe you. it's a Best Buy location in Florida but that's all i'll say. I also like the 16gb over the europeans 8gb. matter of fact i like it twice as much. i was worried about space and the fact they go out of their way to limit you from changing the cards. Really wish this was a LTE device...oh well, can't have it your way all the time. I'll hold out for the Revolution, i already have one 3G device...i don't need two. May 12th is here and this phone still hasn't been released. What is the hold up now? I just recieved a memo about the trophy from my verizon rep here at target mobile. the release date is still not known, but with this info hand out it is on its way to target mobile/ radio shacks then in the near feature as well as at b.b. yeah for windows phone 7 and from what my rep said, MANGO WILL BE AVAILABLE once it has been release from microsoft!!! Radio Shack doesn't sell Verizon Wireless phones. So its hard to believe your post.